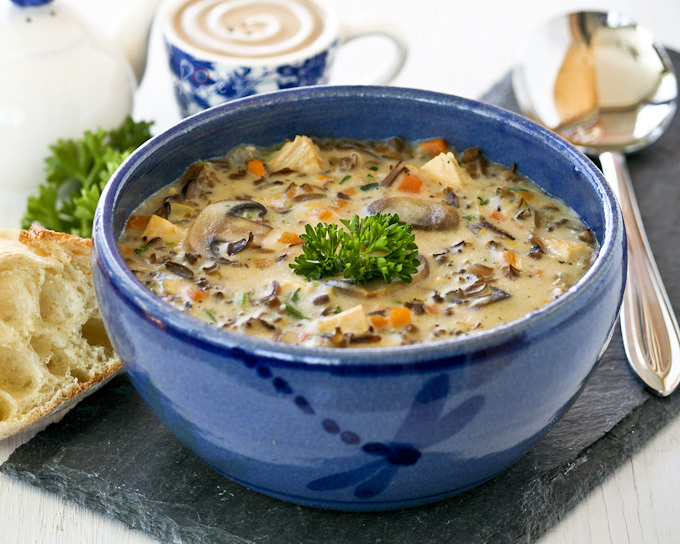 Few things are more comforting than coming home to this easy and deliciously creamy Slow Cooker Chicken Wild Rice Soup. It’s a Minnesotan favorite! 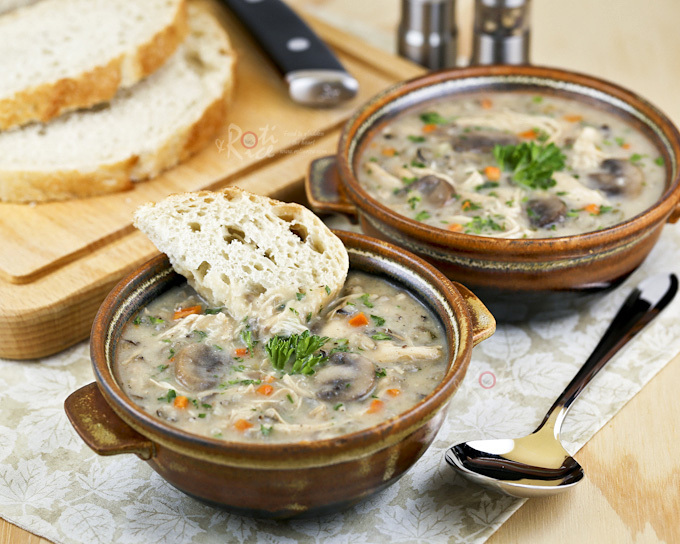 To date, the most popular recipe on this blog is non other than my version of Minnesota’s ever popular Chicken Wild Rice Soup. This hearty soup is a delight in the warmer months and a comfort in the colder months. A such, I cook this soup year round. Many have asked for a slow cooker version and so I have decided to list down the steps in this recipe. The ingredients are essentially the same except for a minor change. The previous version calls for vegetable oil to saute the vegetables at the beginning. 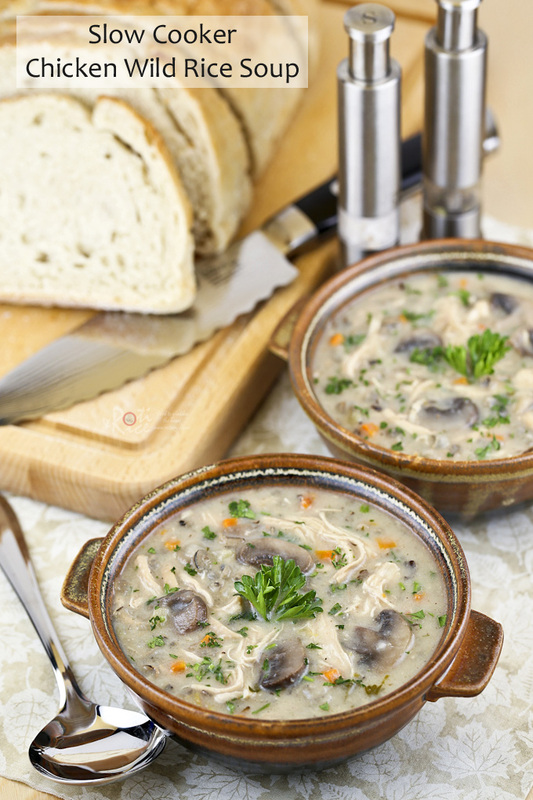 This Slow Cooker Chicken Wild Rice Soup uses butter to make the roux towards the end. This gives the soup a deeper and more rounded flavor. For convenience, I used some leftover rotisserie chicken which I simply shredded. You can use cubed fresh chicken if preferred. 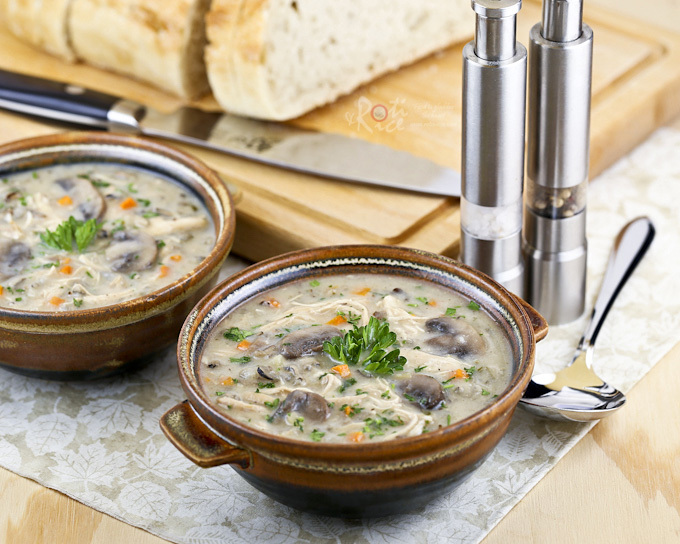 Few things are more comforting than coming home to this easy and deliciously creamy Slow Cooker Chicken Wild Rice Soup. It's a Minnesotan favorite! Place onions, carrots, celery, chicken, wild rice, mushrooms, and dried thyme in the slow cooker insert. Pour in the chicken stock. Cover and cook on high for 6 hours or low for 8 hours. About 45 minutes before soup is ready, pour in the milk. Melt butter in a small saucepan. Add all-purpose flour and stir constantly for 2 minutes. Then add 1 cup (240ml) water and continue to stir. Immediately pour this mixture into the soup. Add salt and pepper. Then give it a good stir. If soup is a little too thick, add a little more chicken stock or water to desired consistency. Cover and allow soup to finish cooking in the slow cooker. Stir in chopped parsley just before serving. This thick, hearty, and creamy Slow Cooker Chicken Wild Rice Soup is a joy to come back to after a long day at work. It is so comforting and satisfying served with a thick slice of crusty bread. I’ve got you covered if you want the soup in less than a couple of hours. Here is my stove top version. Please click on the picture below to get to the post. that looks amazing my friend. I hope you have been having a great summer. I love that it was made in the slow cooker. Making this right now. I do understand that my crockpot cooks things a “little” faster than the times in most recipes but this one has blown me away. It has been on low for a little over 4-1/2 hours and there is hardly any liquid left. Hopefully I can get it to turn out okay. It’s just past 3pm so way too early for dinner! The cooking times are approximates only as different cookers do cook differently. This soup is very forgiving and it should be just fine if you add in a little more chicken broth or water. Forgot to add that I even used about a cup extra broth because I had extra from the homemade broth I thawed. Could almond milk be used or is dairy milk best? Thanks! Although I have not tried it, I don’t see why almond milk cannot be used. I do use almond milk in many of my smoothies. 🙂 Of course dairy milk would make the soup richer and creamier. Do you think I could get away with less broth and putting the chicken in raw chunks? You can definitely put in raw chicken but the soup is quite thick and less broth may not be the best thing to do unless you also reduce the amount of all-purpose flour and wild rice used. I happen to have Greek yogurt and no milk. Do you think I could use that in its place? I have not tried using yogurt in place of milk. Plain Greek yogurt is a little tangy and it may alter the taste. If you plan to freeze this soup, I would suggest leaving out the milk. Only add it when you reheat. I don’t have wild rice. If I were to substitute regular white rice, at what do you think I should add it? 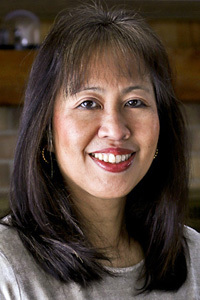 I would use a mixed grain or rice mix instead of white rice. Wowzers! Great instructions and good to know I can make this in the slowcooker. This is my husband’s favorite soup!! and I just made a pot for him today because he’s feeling a little under-the-weather. I’ll try it next in the slowcooker. Thanks so much for sharing!! Just discovered this wonderful creation while looking for soup recipes! Turned the crockpot on a few minutes ago–can’t wait to try it! I added my favorite herbes d’Provence blend instead of just thyme because it is so great with chicken. My sister in law has celiac’s disease. I was wondering if the consistency would change by using rice or gluten free flour. What do you think? P.S. I just made the stovetop version, it is wonderful and I foresee this being in our normal dinner roatations! Thank you for the recipe! I often use rice flour in place of all-purpose flour because of gluten sensitivities at our house. The consistency should be more or less the same. Looks delicious, but step 3 of the instructions looks incomplete. Could you check it, please? How much minutes before soup is ready you pour the milk? Thank you so much for sharing this recipe. It is so good! I made it last week and everyone loved it. I am getting ready to make it again.